This Irish blessing plaque features a hand painting on a wooden sign that is enhanced with a shamrock. This Irish blessing plaque says: May The Road Rise To Meet You. This Irish blessing plaque features a hand painted message and shamrock on a distressed wooden sign that is enhanced with primitive appearance. 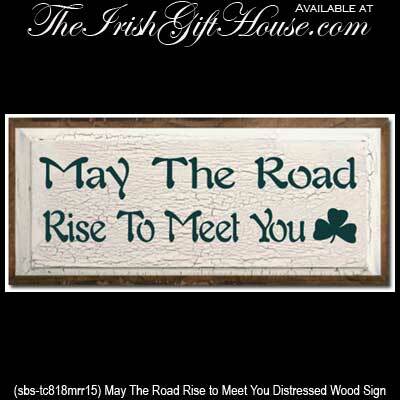 The Irish blessing sign is made of wood and measures 18" wide x 8" tall and it is ready to hang on your wall. This wooden Irish sign is made in the United States and is received with a shamrock history card that is complements of The Irish Gift House.